Here’s an interesting idea I had inspired by some of the recent news. Hope you’ve brushed up on your math skills. Both pictures are taken at the same zoom level in Google Earth. Am I suggesting we replace the prison with an arena? Not exactly; it’s just interesting to see that an arena, even with some parking, can fit on this site. 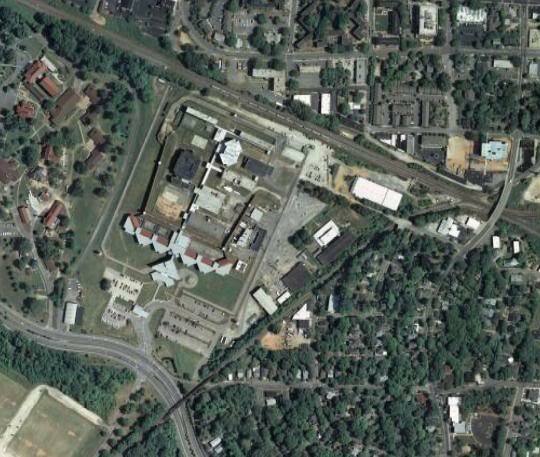 The RBC Center and prison are not going anywhere any time soon so think of it with a planning point of view. Lets bring this back up 26 years from now. Next Post → Say Hello To The 500 Block of Fayetteville St.
How about a baseball stadium? Have it so behind centerfield is downtown Raleigh. Ah, one can dream. If the Triangle ever gets MLB, they’ll probably promote the Durham Bulls instead of bringing in another team. I just can’t imagine siphoning that kind of traffic in and out of Western Boulevard. There would definitely have to be a well-established transit system/stop on the adjacent rail line to keep it from being choked. Boylan Heights would probably complain about the cut-through traffic just like Victorian Village in Columbus, OH did when the old prison site was demolished to make way for Nationwide Arena. With proper traffic management, it could probably be done. One day, Western could have some kind of street car going down it. It has that huge median that may be able to fit a line. Throw in a train station on the north side, good pedestrian access to downtown and across the tracks to Morgan/Hillsborough St. area and you never know it just might work. Not now though, need to jump ahead in time a bit. “Just for fun”: The Boylan Heights residents will eat you alive for even thinking about the possibility :LOL: Not a bad idea, though. Leo: Good vision. Raleigh needs to start considering sites in Downtown Raleigh for the RBC Center (where it should have been from day one). An arena downtown would be nice but not practical in Raleigh. 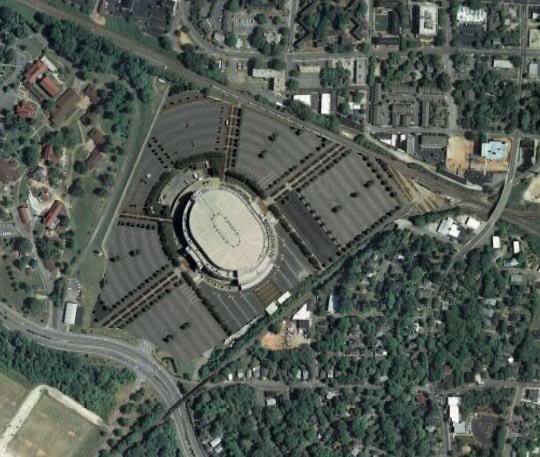 I for one do not want to sit in a parking deck for a 2 hours after a game waiting for the traffic to disperse down Western Blvd., Ashe Ave, or Boylan St. Everybody complains about the RBC Center’s location, but nobody has a problem with Carter-Finley being where it is. The planners at the time realized that RTP has a workforce of 40,000 employees a majority of which, at that time, drove from Cary or North Raleigh. Guess where the arena is? Between North Raleigh and Cary off of I-40 and I-440 two major feeders. When commuter rail is built then you can explore a DT location, but otherwise you are ignoring the 85% of Triangle residents who don’t live ITB. While I’m not the biggest sports fan, this is a great post Leo. We could call our baseball team, The Raleigh Slammers! Steelcity, I agree with you. It’s not practical….yet. While the rest of downtown grows and more infill takes place, the prison will preserve this land. 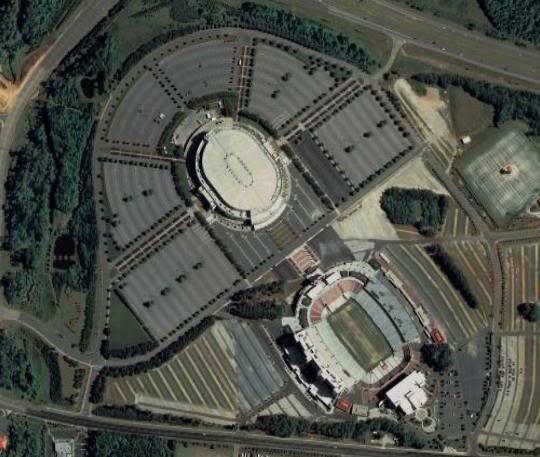 THEN when the RBC center needs to be replaced and possibly the prison needs more expansion, the idea of moving it can be brought up and this location can be considered for an arena or stadium or whatever. Assume this is Raleigh 2030, not now. I echo one of Steelcity’s experiences after having waited hours to get out of the deck at old Busch Stadium in Saint Louis while I was in college. Later, I had the chance to ride the Red Bird Express light rail and it was like night and day. Can you imagine what it would be like to get to Yankee Stadium or Shea by car instead of using the subway? Same story. I think that’s also contributing to some of the success of AT&T Park in San Francisco and it’s proximity to BART and MUNI. This also goes for the Washington National’s new stadium or the MCI Center – the best way is by Metrorail. I agree that in the future say 2030 we should be thinking of a Downtown location, only if we have light rail. But many posters to this sight and others throughout the years have bad mouthed Steve Stroud, Tom Fetzer and the City Council for placing the arena where it is now. Guess what? At that time they were looking at research showing that in the years 2006-2010 development would occur in that area. They were only wrong on one account and that is restaurant/retail establishments didn’t pop up. Now that more offices and apartments are being built in that area those establishments will soon follow. For the year 2030 and beyond I like your site suggestion, but it would work better on the other side of Western Blvd. on the old Dix landfill so that people could easily access Centennial Parkway to I-40 for a fast exit. It’s interesting that Steelcity brings up Steve Stroud and Tom Fetzer in this discussion. I clearly remember that when the RBC Center was being pushed, the idea for it was to become Raleigh’s version of the New Jersey Meadowlands. That vision hasn’t materialized and the Meadowlands complex is already being planned for sequential demolition and rebuilding. And, not surprisingly, NJ Transit is finishing up a train spur from Hoboken on the Pascack Valley Line. So, if you would want to take a train from Midtown Manhatten to a Jets or Giants game, it’s going to be possible. No more bridge and tunnel driving!! I think that we should copy Charlotte; by that I mean we should build a stadium with almost identical design to theirs, street realignment and all, and build a seven to ten story one block size parking deck with skyways that connect to the main building. Now, you are probably wondering about how to deal with traffic. Here is my solution: have it built within two to four blocks of the planned Mass Transit Center to help with traffic and access. And to reduce the walking distance, we could even have rail cars running from the MTC to the stadium. That should about handle traffic issues. Comments?? Leo, good idea. It’s going to be a long while before the state vacates the land, but I hadn’t considered it before. Put a rail stop there, add in a ped/bike bridge to Morgan St, eliminate the surface parking (a few decks should do), add in some mixed use development, and we’re talking! Steelcity36, I am really glad to see that someone actually gets it :) As much as I love to have an arena downtown, I understand that it is not practical today, and it could still exclude the vast majority of people who actually attend sports events. Before we can discuss a downtown arena we need to build density nearby, a good transportation system and promote our downtown a lot more. Until then, we can only talk and plan about getting an arena in 10, 15, or even 20 years down the road. Leo – First, allow me to commend your creativity, your Google Earth acumen, and your ability to set aside perceived constraints for the opportunity to dream. The subsequent pontification exists to embolden the understanding of the role / potential of activity generators, and isn’t intended to ‘p!ss in your cornflakes’. The fatal flaw of the proposed site does little achieve a more concentrated land use pattern, or more importantly: capture the consumer spending potential of arena patrons. Siting the arena this far outside of downtown proper would only result in just a new physical location that fails to significantly reduce auto-dependency. How many folks are going to walk from there to Moore Square / Fayetteville Street / Glenwood South, etc.? Further, its context west of Boylan Heights presents a palpable barrier to foster connectivity and access to/from downtown. To maximize potential economic spinoff, it may be more prudent to look for sites that offer a higher amount of connectivity to established activity centers. Like others have said, increased density and transit are complementary actions that would enhance the accessibility of such a site and position it to guide land use in such a way that favors conditions that lead to a virtuous economic climate. Personally, I’ve often favored the site just west of the Performing Arts Center, or the block that currently houses the Lincoln Theater. Javier, thank you for the kind words, I appreciate it. I’ll agree that an arena/stadium at the proposed site is not a good idea at this current time. Raleigh’s auto-centric culture calls for a sports venue with easy auto access and that is why we have the RBC Center in its current location. 99.9% of patrons get there with a car. I can probably say 100% if you include buses but they are still 4 wheeled vehicles that use the highway. Anyway, you get my point. This location, as I see it, has the potential for something large but not now; 20-30 years into Raleigh’s future. With the right infrastructure in place then, a huge arena or stadium CAN work here. There are rail corridors on two sides and the planned Multi Modal Transit Center can be connected with easy pedestrian bridges. This allows people to travel in four directions from downtown and the arena. For the car drivers of the future, Western BLVD can still be used and its wide median can then accommodate a streetcar system connecting more people to this area and getting them off the road and out of their cars. The easiest way to get pedestrians to this area from downtown that I can see is to provide access over (under?) the tracks at Mountford, McCulloch, or Cabarrus St. You could also shoot Snow Ave. and Mayo St. over the tracks to provide some connectivity from the north. If you are willing to walk from Moore Square to Glenwood South now, then a walk straight down Hargett or Morgan St. from Moore Square to the site is no different. Plus, forget walking; if we do not have a DT circulator system set up at this time in the future then we have failed miserably. I do agree that putting an arena right in the middle of downtown, such as the Lincoln Theater block you suggested, would have the highest economic impact. If here, the transit needs would be much much higher. The arena/stadium idea is based on A LOT of factors so I’m glad you do see this post as a ‘dream’. We’ll just have to wait and see how things turn out and decide later. I find it really interesting how the decisions of today can affect the possibility of something grand like this ‘proposal’ coming to life. Great discussion! Is that central prison? What a fabulous idea, boot the prison from downtown Raleigh in exchange for a revenue generating event location. As for traffic, do we really think that an arena like that would be built without implementation of some traffic flow. The ESA has great traffic flow and look where it is located. Put parking deck on Dix property with a pedestrian bridge over western. Direct traffic to back exit towards centennial campus where they can get on 440 via lake wheeler or the proposed centennial campus exit.